Meliora is pleased to announce an update for Meliora Testlab codenamed “Pitch drop”. This version brings you a number of enhancements and optimizations and is available immediately for our hosted version customers. The version includes many features requested by our clients and we would like to thank you for all the feedback! The version offers features for integrating your Testlab with Atlassian Jira issue tracker. 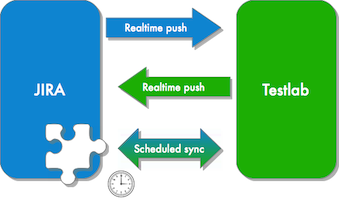 Implementation includes a true two-way synchronization module which enables you to synchronize the issues in real time between your Testlab and Jira deployments. This way you can continue to use your established method of working with issues with Jira and be more productive with requirement and test case planning and test execution with Testlab. This feature is available for all Enterprise Suite installations. You can read more about the feature from here. To keep you up to date with events in the project you are currently logged in Testlab delivers you real time events. The events are presented as floating notifications at top right corner of the user interface. Clicking the notification opens up the associated asset in your Testlab. In addition to the regular project events such as changes in the project assets all assignments are delivered as sticky notifications. This means that when an asset is assigned for you the notification will stick to your user interface as long as you click the notification to open up the asset or dismiss the notification. 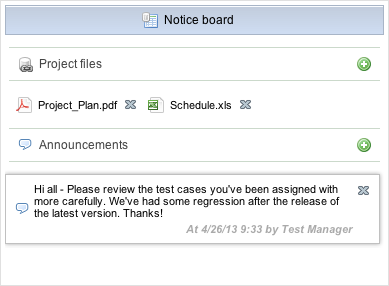 A new dashboard widget is offered to easily communicate with the users in your testing project. A project notice board offers a place to store your shared project assets and publish announcements. Announcements can be targeted to specific user roles and optionally tagged as important which delivers the announcement to all users on next login in a pop up window. 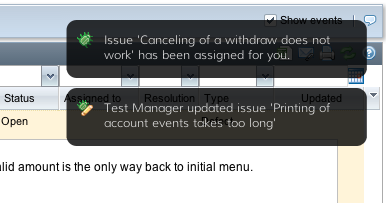 By default test managers and project managers can manage the content of project’s notice board but new permission keys are included to control who can publish the content. In addition to this all administrator users of your company can publish company wide announcements which are shown to users in all projects in your company. Testlab’s test case hierarchy tree is enhanced with a new set of filters which make it easier to highlight the test cases for re-testing. Filters make it easy to pick all not passed test cases from current test case hierarchy as a whole, for a specific version or for a single test run. When re-testing previously tested features use these filters in execution planning view to easily add test runs for test cases previously failed, blocked or not tested. Combine the above with the use of your personal work set in execution planning and adding test runs for re-testing couldn’t be easier! Editing window for issues has a new streamlined layout which makes commenting of issues easier. When publishing comments the content is now automatically linkified so that all external links are rendered as clickable links. In addition to this comments can now be deleted. In addition to the features described above Pitch drop includes some magic under the hood to make the use of Testlab even snappier than before with network transport enhancements and more intelligent on-need-basis refresh logic for asset hierarchies. Pitch drop? In 1927 Professor Parnell heated a sample of pitch and poured it into a glass funnel with a sealed stem. Three years were allowed for the pitch to settle, and in 1930 the sealed stem was cut. From that date on the pitch has slowly dripped out of the funnel – so slowly that now, 80 years later, the ninth drop is only just forming. In the 80 years that the pitch has been dripping no-one has ever seen the drop fall. You can try your luck here.